O Lord Jesus Christ, our God, having shown Your Holy Mother to be more Honorable than all the heavenly powers, through her intercessions and those of all Your Saints, provide spiritual comfort and forgive me Your unworthy servant; forgive whatever I have sinned today as a human-rather as a sub-human being-my voluntary and involuntary transgressions, which I have committed in knowledge or ignorance, through beguilement, or by my own inattention, great laziness and negligence. If I have sworn by Your Holy Name, if I have committed perjury or blasphemed in thought, If I have stolen anything or lied or in any way irritated You; If a friend came to me and I slighted him, If I have grieved and embittered a brother, If, while standing to pray and sing psalms, my evil mind wondered off toward earthly and evil things; If I ate more than the appropriate amount or engaged in idle talk, If I laughed imprudently or had vainglorious thoughts, If I behaved arrogantly or looked upon vain beauty, and my mind was attracted by it; If I talked idly about things I should not, If I curiously examined the fault of my brother and condemned him, while my own innumerable faults I overlooked; If I neglected my prayer, or brought to mind any other evil thing-all these many things, and others, that I have done and do not remember, forgive me, O God, that I, the prodigal, may sleep in peace and find rest, glorifying You, together with the Father, and the All-Holy and Good and Life-Creating Spirit, now and forever and to the ages of ages. Amen. On January 12th Our Holy Orthodox Christian Church commemorates, honors and entreats the holy intercessions of the following Saints, Forefathers, Fathers, Patriarchs, Prophets, Apostles, Preachers, Evangelists, Martyrs, Confessors, Ascetics, Teachers and of every righteous soul made perfect in Our Holy Orthodox Christian faith: Holy Martyr Tatiana of Rome, the Deaconess; Holy Martyr Peter Absalom of Eleftheropolis in Palestine; Holy Martyr Mertius; Eight Holy Martyrs of Nicaea were perfected in martyrdom by the sword; Holy Martyr Efstathia was perfected in martyrdom by the sword; our Righteous Father Elias the Wonderworker of Egypt; our Righteous Father Benedict, Egoumenos (Abbot) of Wearmouth and Jarrow; our Righteous Fathers Martinian of Belozersk and Galaction his disciple. +By the holy intercession of Your Saints, Holy Martyrs, Holy Mothers, Holy Fathers, Holy Deaconesses, Holy Righteous, Holy Wonderworkers, Holy Egoumenoi, O Christ Our God have mercy on us and save us. Amen. 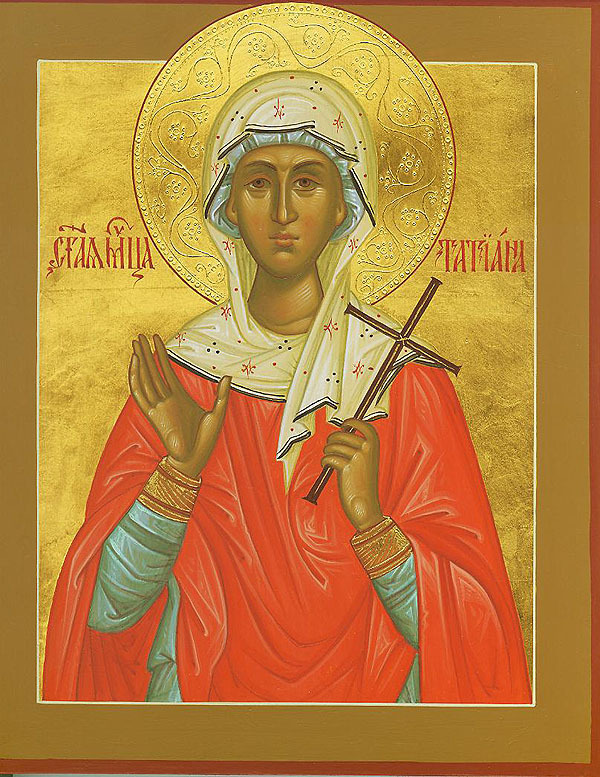 THE HOLY MARTYR TATIANA. Saint Tatiana was the daughter of a most distinguished Consul of Rome. She became a deaconess of the Church, and for her confession of the Faith of Christ, she endured many tortures; as she was suffering, Angels punished her tormentors with the same torments they inflicted on her, until they cried out that they could no longer endure the scourges invisibly brought upon them. She was beheaded during the pagan Roman emperor Alexander Severus (225-235 A.D.). Thou didst shine resplendently, Martyr Tatiana, in thy sacred sufferings and in the crimson of thy blood, soaring to Heaven like a fair dove; hence, ever pray Christ for all them that honor thee. This: Repent, and being strengthened by the power of grace in the Holy Mysteries (Sacraments), walk in the path of God's Commandments, under the direction which the Holy Church gives you through its God-given Priesthood. All of this must be done in a spirit of sincere faith which has no reservations. Faith is the sincere confession that God, Who is worshipped in, the Trinity, Who created all things and provides for all, saves us who are fallen, through the power of the death on the Cross of the Incarnate Son of God, by the grace of the Most Holy Spirit in His Holy Church. The beginnings of renewal, which are established in this, life, will appear in all their glory in the future age, in a way that the mind cannot comprehend nor the tongue express. O our God, how great are Thy promise! b) Then by abiding in God in mind and heart, endeavor to, fulfill in body the duties and affairs which your station in life imposes upon you. c) In this labor most of all guard your heart from evil thoughts and feelings--pride, vainglory, anger, judging of others, hatred, envy, scorn, despondency, attachment to things and people, scattered thoughts, anxiety, all sensual pleasures and everything that separates the mind and heart from God. d) In order to stand firm in this labor, resolve beforehand not to withdraw from what you recognize to be necessary, even if it may, meant death. To achieve this, when you first resolve to do so, offer your life to God in order to live nor for your own sake, but for God alone. e) A support for life in this manner is a humble offering of one's self to the will of God, and not depending on one's self; the spiritual arena in which this life is accomplished is patience or unswerving stand in the ranks of redeemed life, with a cheerful endurance of all the labors and unpleasantness that are linked with this. f) A support for patience in faith or the assurance that, working in this way for God, you are His servant and He is your Master, Who sees your efforts, is gladdened by them and values them; hope that the help of God which is ever protecting you, is always ready and waiting for you, and will descend upon you in your time of need, that God will not forsake you to the end of your life, and preserving you as one faithful to His Commandments here, among all temptations, He will lead you through death to His eternal Kingdom; love, which meditates day and night upon the beloved Lord. In every way strive to do only what is pleasing to Him, and avoids everything that might offend Him in though, word or deed. g) The weapons of such a life are: prayers in church and at home, especially mental prayer, fasting according to one's strength and the rules of the Church, vigilance, solitude, physical labors, frequent confession of sins, Holy Communion, reading fo the Word of God and the writings of the Holy Fathers, conversations with God-fearing people, frequent consultation with one's spiritual father about all the events of one's internal and external life. The foundation of all these labors in measure, time and place is wisdom, with the counsel of those who are experienced. h) Guard yourself with fear. For this remember the end--death, judgment, hell, the Heavenly Kingdom. Most of all be attentive to yourself: preserve a sober mind and an untroubled heart. i) Set as a final goal the kindling of the fire of the spirit, so that the spiritual fire will burn in your heard and, gathering up all your strength into one, will begin to build your inner man and finally burn up the tares of your sins and passions.